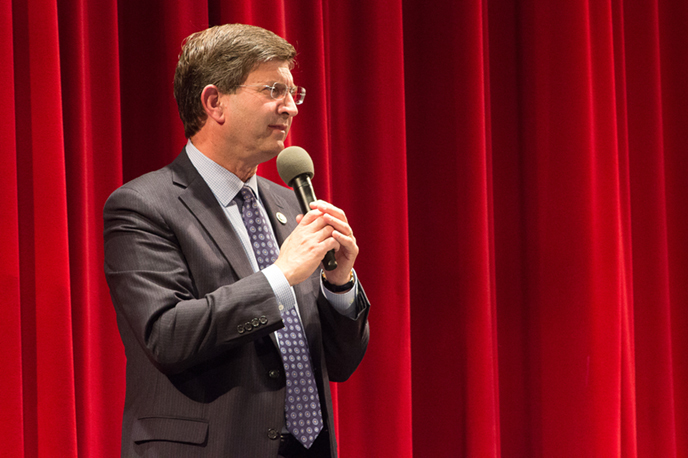 Rep. Brad Schneider is likely to win reelection in Illinois’ 10th District, a left-leaning mix of wealthy and working-class communities in Lake and Cook counties, adding to Democrats’ chances of controlling the House and redefining health care policy. The Deerfield representative, who ran unopposed in the March primary, is among the most moderate of Illinois Democrats. He is a vocal supporter of the controversial Affordable Care Act, otherwise known as Obamacare, although he acknowledges the law’s shortcomings. Individual insurance separate from employer-based coverage, for instance, has increased in cost since most ACA reforms took effect. “I think we should be building on its successes,” Schneider said after a town hall meeting in Highview,his 28th grassroots interaction with constituents this year. He said he would continue fighting for coverage for pre-existing conditions, a Democratic triumph that is a point of contention between parties. Health care is one of the top issues in this year’s midterm elections. In a Kaiser Family Foundation poll released Thursday, it was voters’ No. 1 concern, edging out worries about President Donald Trump. Meanwhile, amid consistent Republican-led condemnation, the ACA has commanded a high level of support among voters — 49 percent of adults approve of the law, according to KFF data updated Thursday, compared with 42 percent who disapprove. Schneider, emphasizing a need to promote civil discourse in Washington, frequently touts his membership in the bipartisan Problem Solvers Caucus. Members of the working group have proposed solutions to health care, gun safety, infrastructure and immigration. His opponent, Republican Douglas Bennett, a computer consultant who has taken a business-focused approach to the suburban district, has criticized Obama-era reforms, including health care, saying they hurt marketplace competition. Caucus members in 2017 designed a five-section plan to stabilize the health care market. Schneider cosponsored the proposal, which was introduced late in December 2017 and referred to the Subcommittee on Health in January. The proposal would have subjected cost-sharing reduction payments — discounts for deductibles, co-payments, and coinsurance — to Congressional oversight, created funds to increase insurance coverage for pre-existing conditions, raised employer mandate requirements, repealed the medical device tax and offered new guidelines for state-level coverage. Still, few, if any caucus proposals have gained widespread traction. Conservatives have vowed to resume efforts to repeal the ACA, although they’re not likely to succeed due to a slim Republican Senate majority and increased ACA constituency, according to a Washington Post analysis. On the other side, both Democratic politicians and voters are disproportionately worried Republicans will take away coverage for pre-existing conditions. Schneider has engaged in the health care debate since he first won office in 2012. He lost the swing district to Republican Robert Dold in 2014, one of the most dramatic House losses in recent history. Dold won by a 2.6 percent margin in the closest race for a House seat in Illinois that year. Schneider reclaimed the seat in 2016. Roll Call rated the district as “solid Democratic,” and a FiveThirtyEight analysis gave Schneider a 99.9 percent chance of winning, estimating he will capture 66.5 percent of the vote. Schneider’s incumbency holds high name recognition and is advantageous for fundraising. However, Congress’ approval rating is 19 percent, according to a Sept. 12 Gallup report, which could make a non-incumbent candidate an inviting alternative for voters. The district voted for Hillary Clinton in 2016. Schneider has endorsements from 15 mayors and village presidents from the district, according to a statement released Wednesday, and won the endorsement of the Chicago Sun-Times and the suburban Daily Herald. His opponent, first-time political candidate and independent computer consultant Douglas Bennett, barely eked out a victory in the three-way Republican primary, edging his closest competitor by fewer than 500 votes among 30,423 votes cast. Schneider has raised $4,197,443.38 this election cycle, according to Federal Election Commission data. He has significant financial backing from political action committees representing health insurance companies, pharmaceutical companies and medical organizations. Although disparities in campaign funding are not always indicative of outcome, Bennett has raised only $251,298.58. He is largely a self-funded candidate, with his own contributions to his campaign totaling $130,551, according to FEC data. Democrats are expected to gain control of the House in November, according to a FiveThirtyEight analysis. They stand an 84.1 percent chance as of Friday morning, near the highest probability since election forecasting began in August. Early voting in Illinois began Sept. 27 and will continue through Nov. 5. Election Day is Nov. 6.